First place winner of the 2018 Teen Driver Safety Billboard Contest - Columbia High School students Fiona Medina and Emma Roberts’ artwork. The Teen Driver Safety Billboard Contest was hosted by the Safe Communities Coalition and State Farm®. Anything a driver does in addition to driving while behind the wheel increases their risk for a crash. Eating, reading, changing the music, putting on makeup, checking social media, texting, and phone calls are all distractions. Distracted driving is a problem beyond just texting and driving. Local numbers: In 2016, 389 traffic crashes in Lorain County involved a distracted driver. 3 of these were fatal crashes—resulting in 3 people dead. More people view drivers texting or emailing while driving as a serious threat (96.8%) than drivers talking on cell phones (87.7%). To change any behavior (habit), remember it will take time. According to the Fogg Behavior Model, three things need to happen in order for a behavior to change: motivation, a trigger and a realistic way to take action. So you want to stop driving distracted? Awesome! Now ask yourself 3 questions to think through what you’ll need to actually drive focused. 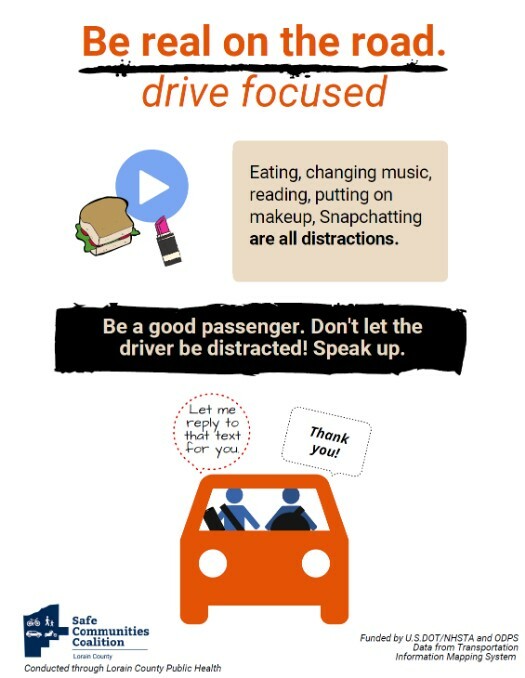 What will motivate you to not use your phone while driving? Could be money/fine, keeping your driver’s license, safety of self or others. 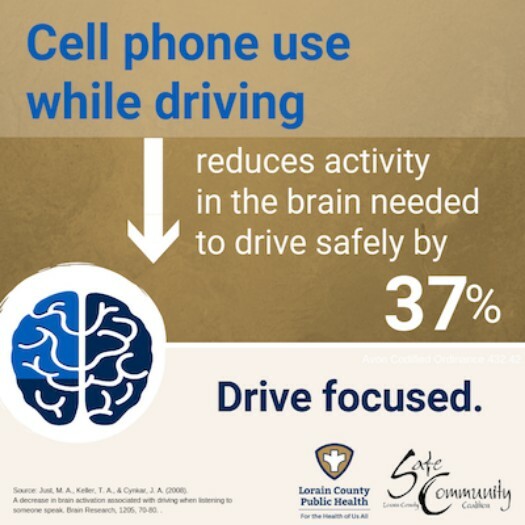 What will help you drive safe and focused? See our 3 ways to drive more focused below. As soon as you get in the car, put your phone on “do not disturb” and set it out of reach. Find an app that blocks texts and phone use while driving. Practice mindfulness - Keep your mind on driving, eyes on the road, and hands on the wheel. Make time for living - Eat at home or pick up take out and eat in a grassy area, rather than while driving. Put makeup on before you leave the house or once the car is parked. If you’re in a car and the driver is distracted, speak up. Offer to write a text or navigate the GPS for your driver. If you notice unsafe driving behavior report it to the Ohio Highway Patrol – call #677. Source of stat in image: Just, M. A., Keller, T. A., & Cynkar, J. A. (2008). A decrease in brain activation associated with driving when listening to someone speak. Brain Research, 1205, 70-80.